Before Clear Spring existed, Nathaniel Nesbitt, Sr.,owned the land on which it now lies. He had purchased 105 acres in 1754 after he emigrated from Northern Ireland. It is said that during the summer he would go to Maryland to farm the land, but would return to his home in Lancaster County, Pennsylvania, in the winter for protection from Indian raids. In 1761, Nesbitt married Veronica Whitmer and settled on the Maryland property that was then called Locust Thickett. His original 105 acre purchase was eventually expanded to 696 acres and patented under the name of Nesbitt’s Inheritance. When Nathaniel Nesbitt, Sr., died in 1807, he divided his land among his five sons. Peter Nesbitt inherited a parcel of land south of the present-day Route 40, east of Clear Spring. Peter died when he was 32, and the land was sold when his widow remarried and moved away. Between 1803 and 1813, Nathaniel’s son Jonathan Sr., built a substantial brick home on his inheritance at what is now Mill Street and Broadfording Road. Jonathan Sr.’s eldest son Otho inherited the family home and lived in it until his death in 1893. At that time, Otho’s son Jefferson Nesbitt sold the property to John T. Snyder and his sons. Part of this house still faces north at this corner. The original structure was symmetrical and had matching wings, which included a ballroom, on the east side of the double recessed porch. The Snyders removed this wing. The reason given was that the house was too large for a tenant house. The bricks then were used in the Feidt home near Blair’s Valley Lake. The east end of the house is stone, and the entire structure was painted red. What remains of Jonathan Nesbitt’s home is an impressive though neglected home. The front door has six raised panels on the outside and battens on the inside. It is hung on iron hinges more than two feet long. In the broad entry hall, the stairway to the second floor makes an easy rise opposite the door. Beneath it the cellar steps descend, lit by a six-light transom over the cellar door, an unusual feature. At the other end of the hall a door exits onto the lower porch. Interior doors have thumb latches, and the two parlors on the west have corner fireplaces. One of the mantels has reeded double pilasters. The huge cooking fireplace still dominates the kitchen to the east of the hall. Floors throughout are random-width pine. At the end of the porch is a small room entered only through a door on the porch. It has two outside windows and a third into the back parlor. The porches have square chamfered columns and scroll-cut splats in the balustrade. Otho Nesbitt took care to keep family letters and records, and he kept diaries that began in 1842. In them he records mundane weather and business information as well as a chillingly graphic description of the battlefield at Sharpsburg after the Battle of Antietam. Following descriptions of amputated limbs and the amputation process, he writes in part …Sept 19. Went on the battle field again…The Union men were nearly all buried…I rode on to the battle field where the Rebels formed their line of battle. They were not buried. I could see their line distinctly by the dead lying along it as they fell. Nearly all lying on their backs as if they hadn’t even made a struggle. The line I suppose was a mile long or more. I could sit on my horse and count 50 dead men. Just around about. On the side 100 yards further I cold do nearly the same. Along the turnpike and the fences on each side they were lying thick. They fell all over the fields more or less as they retreated…there lay 2 horses and 9 men as if the thunder had struck them…Near the pike I saw a white bull or steer lying on his back all swelled up and 2 sheep nearby all swelled up…I saw Samuel Mumma’s fine brick house and barn that was burnt and a small stable close by with a dead horse that had busted the door half way open as he fell. The descriptions go on for pages giving a human horror to the historic battle. Far across the road and up a rise, on the land he also inherited from his father Nathaniel Nesbitt, Jr., built his home facing that of his brother Jonathan. It is an elegant two-and-one-half story, white-painted brick laid in Flemish bond on the front façade. Jack arches top the six-over-six windows, interior double chimneys rise at either end and a large wing at the back forms an ell with double recessed porches on the west side. At the front of the house, four octagonal columns support the porch pediment that protects the entrance. A broad transom and sidelights surround an unusual eight-panel door. Inside, a broad hall extends through the house and exits onto the lower porch of the wing. At the far end of this hall on the left side, lovely stairs with a curved rail wind to the top floor. A stylized wing design decorates the stringer at each step. Off the grand hall are several reception rooms each with fireplaces and dramatic, pilastered mantels. Window jambs are paneled and doors grained. In the kitchen, the last room in the ell, the cooking fireplace has been closed. Beneath the double porch is a walkway, half underground, that accesses two rooms. The room under the kitchen contains another cooking fireplace and the forward room yet another fireplace with a simple mantel. This basement area can also be accessed through a bulkhead in the floor of one of the rooms on the first floor. In the attic, with its two rooms and a broad hall, the ceilings are low, the plaster original and the doors closed with handmade thumb latches. Light enters through the lovely arched, muntined windows of the three dormers. In one room is a tiny, narrow slave bed. The Nesbitt family sold this lovely home to Tobias Johnson, nephew of the first governor of Maryland. After that, the Snyder family acquired it. Both these homes are now part of the extensive estate of C. Harold Snyder. Under the terms of his will, his estate is to be distributed in equal shares to nine churches and charities by the trustee, the First National Bank of Maryland. Clear Spring Mayor Betty Shank is concerned about the enormous impact these farms would have on the quality of life in Clear Spring if they were to be sold for development. The tenants in Nathaniel Jr.’s house have lived and farmed there for over twenty years; those in Jonathan Sr.’s for four. Both are concerned about the future of their homes and of themselves. Epilogue: The First National Bank took a long time to settle the Snyder estate. The tenants in Nathaniel Jr.’s house remained during this period, but the tenants in Otho Nesbitt’s house left, and the house was not properly secured. Thieves entered repeatedly and stole most of the hardware and the mantels. The house that had been neglected became dilapidated and forlorn. In 1992, Donald and Charlene Bragunier, owners of a construction company, purchased both farms. Nathaniel Jr.’s house was still rented by the same caring tenants, then it was taken over by their son. Otho’s property became a major restoration project. Initially the Braguniers decided to demolish the post and beam barn across the road from the house. Then, prodded by the Clear Spring District Historical Association, Donald Bragunier resolved to save this unusual barn and sent a crew of men to do a proper restoration. The men worked when time allowed, nearly a year passed before it was completed. When work began on the house, workman discovered that it had been built in three sections. The first two bays on the west are built of log and contain the two corner fireplaces, typically an 18th century feature. Physical evidence indicates that this section had two rooms downstairs with a loft above. This was probably Nathaniel Nesbitt, Sr.’s, house. A stone section containing the foyer and the kitchen was then added to the log house, probably when Jonathan inherited it from his father. Otho probably added the easternmost brick wing and encased the house in brick, changing some of the interior woodwork to be fashionable. 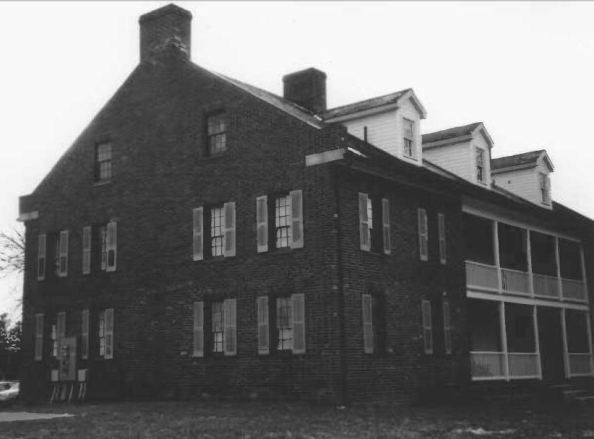 An early photograph of the house, showed double porches on both the front and the back of the house with small rooms at either end. The Braguniers decided to restore these porches using chamfered posts and plain rectangular balusters. They also restored the ballroom wing using old brick from a house demolished in Martinsburg, West Virginia. This new section is a separate living space, perhaps quarters for a caretaker. The first floor contains an ample kitchen, dining room with fireplace and a living room. Upstairs are two bedrooms, bath and closets. No doors access the second floor of the old house. The attic of this wing is separated from the main attic, as well. Period hardware and mantels were found to replace the ones that were stolen. Windows were rebuilt, often building new sashes but using the old glass in them. In the kitchen, the summer beam and joists were exposed and the massive wooden lintel in the stone fireplace was cleaned. Floors were refinished, plaster patched, new systems added and a cedar shake roof put over it all. It isn’t done yet, and the Braguniers do not yet know what they will do with it. They may use it as a bed and breakfast or an antique shop. Perhaps it will be a rental. It could be used for meetings and conferences. Maybe, just maybe, it will be their home. This article appeared in the Herald-Mail Sunday, October 14,1990 as the 16th in the series.